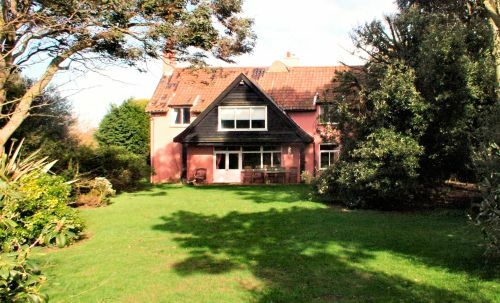 Self Catering accommodation, sleeping up to 13 people in a spacious detached house in Walberswick, quietly situated at the end of a cul-de-sac. Large secluded house with south facing mature gardens. Field path to beach. Parking. Five bedrooms, one with en-suite bathroom. Lovely views from upstairs windows. Ground floor Annexe. Oil fired central heating. Open fire. Front door into spacious hall. Spacious Sitting Room/Dining Room with door to hallway. 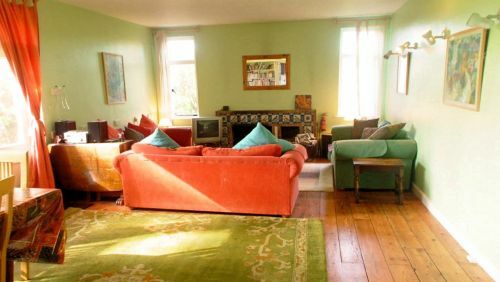 Open fireplace, dining area, French doors to garden. Door to garden from hallway. Ground floor Annexe. Bedroom 1 with bunk beds (note: bunk beds are not recommended for adult use), plus one single bed. W.C. with handbasin. Bathroom: bath with shower over, w.c. and handbasin. Bedroom 2: Double bed. Vanity unit. Bedroom 3: Double bed, plus pull-out single bed (kept underneath double bed, for occasional use). Bedroom 4: Large modern bunk beds – top bunk single, lower bunk double (note: bunk beds are not recommend for adult use). Window seat with garden views. Master Bedroom 5: with double bed, plus pull-out single bed (kept underneath double bed, for occasional use). En-suite bathroom with bath, w.c. and washbasin. Double aspect windows with views over the garden and to the sea. Tariff includes all heating and lighting. Extra charges apply for more than 11 people. One small well-behaved dog allowed, to be kept downstairs (extra charge applies). Short breaks may be available. Please ask. Here you can see the comfortable space of the Sitting / Dining Room with large windows overlooking the garden. The modern Kitchen is well equipped and is connected by double doors to the Sitting Room/Dining Room next door. 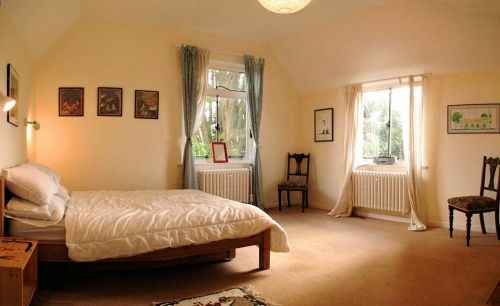 The Master Bedroom has views over the garden and a glimpse of the sea through the trees. In the Annexe on the ground floor there is a children's room with a single bed and bunk beds. The Annexe has its own w.c. and handbasin. There is a large Sitting Room/Dining Room with three sofas around the open fire. The dining area, near the kitchen, overlooks the garden.